I don't know if it is the correct term, but how to write in the score a harp glissando where the hands pass many times from the start note to the endnote? The classical solution I can find is to notate multiple glissando lines, emphasized by an explicit note "up and down ad libitum". Not the answer you're looking for? Browse other questions tagged notation harp glissando or ask your own question. 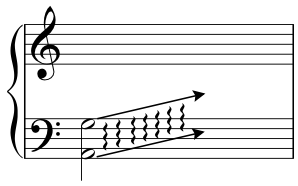 How do I notate sharps in ABC notation? How would this rhythm be written out on a music staff? Is there a term for the practice of omitting staves for the measures that have no music in an orchestral score?